1Department of Paediatrics Chronic Diseases, Queen Paola Children’s Hospital, Antwerp, Belgium; 2Laboratory for Digestion and Absorption, University Hospitals Leuven, Leuven, Belgium; 3Department of Child Psychiatry, Queen Paola Children’s Hospital, Antwerp, Belgium; 4University of Antwerp, Antwerp, Belgium; 5Department of Epidemiology and Social Medicine, University of Antwerp, Antwerp, Belgium; 6Department of Paediatrics, University Hospital Antwerp, Antwerp, Belgium; 7Division of Cardiology, The Hospital for Sick Children, Toronto, Canada; 8Department of Paediatric Gastroenterology and Nutrition, University Hospital Brussels, Brussels, Belgium. Many gastrointestinal complaints and motility disorders are described in patients suffering from different eating disorders. These have a negative impact on refeeding. This report evaluated—on admission—gastric emptying of a standardized solid meal with 13C octanoic acid breath test in anorexic adolescents. The results were compared with age and gender matched controls. Gastric emptying data were related to a subjective symptom score. 21 anorexic girls and 3 boys (mean age: 15.6 y ± 1.3 y), body mass index (mean 15.6 kg/m2 ± 1.6 kg/m2), weight loss (mean: 22.2% ± 10.7%) were studied. T½ of the gastric emptying time exceeded the P95 in 14/24 (58%) patients, classified as having delayed gastric emptying (DGE). One patient (4%) had a T½ exceeding P75 and was classified as slow (SGE), whereas 9/24 (38%) patients had normal gastric emptying (NGE). In comparison to NGE, subjects with DGE had significantly higher symptom scores (p = 0.01) and more weight loss. The DGE and SGE patients lost 25.29% and 21.38% of weight respectively, whereas a weight loss of 17.64% was found in anorexics with NGE. In conclusion, gastric emptying is delayed in patients with anorexia. This is associated with more significant gastrointestinal symptoms and higher weight loss. Anorexia is commonly associated with gastrointestinal complaints such as bloating, nausea, epigastric discomfort, belching and postprandial fullness . These symptoms have a negative impact on refeeding [2,3]. Delayed gastric emptying has been found in both anorexic and bulimia patients mostly for solids and semi-solids, but not for liquids . It has long been debated whether delayed gastric emptying is influenced by the “fear to eat”— cited by Cannon in 1988 and by Inui in 1995 in their respective papers, or whether primary alterations in gastric motor function are the driving force [5-8]. Gastric dilatetion is common in binge-eating . In rare cases dilatetion impairs circulation of the gastric wall and mucosa and may lead to gastric perforation. Gastric emptying of liquids, semisolids and solids can be measured non-invasively and safely using the 13C octanoic acid breath test . The purpose of the present paper is to evaluate gastric emptying of a standardized solid meal in acutely ill anorexic adolescents and to compare these results with previously obtained normal values . We also investigated whether delayed gastric emptying influenced the patient’s subjective symptom score. Gastric emptying was studied in patients suffering from different types of eating disorders (restrictive versus purgatory behaviour). The study was prospective as all patients with anorexia nervosa (AN) and severe gastrointestinal complaints admitted to our Eating Disorder Unit from 2007 till 2008 were scheduled to undergo a 13C octanoic acid breath test on admission. All had gastrointestinal symptoms includeing gastric fullness, bloating, belching, vomiting, epigastric pain, constipation or nausea. All fulfilled the DMSIV (Diagnostic and Statistical Manual of Mental disorders, 4th edition DSM-IV) criteria ascertained by a child psychiatrist and a paediatric nutritionist . 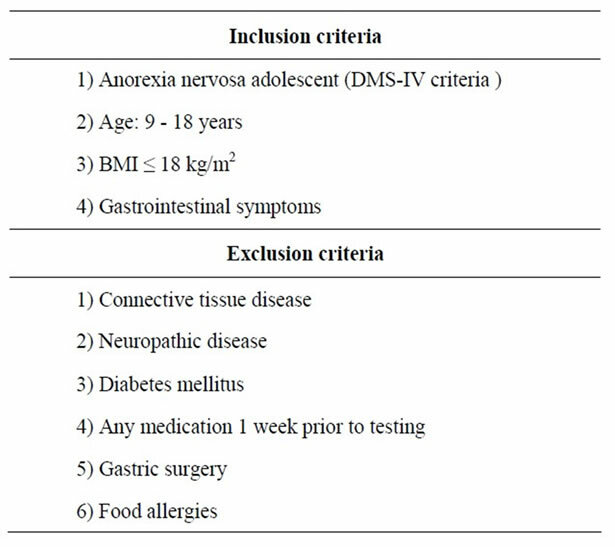 The patients were recruited according to inclusion and exclusion criteria (Table 1). The purpose and methodology of the study were explained to all patients and parents in their native language. The study was conducted according to GCP guidelines and approved by the Hospital’s Ethical Committee (Approval number: 2999). All patients and parents signed informed consent. A clinical examination was carried out by the same paediatrician, specialised in adolescent medicine. A standardized questionnaire was answered concerning gastrointestinal disturbances in their first week of admission, before they had their test meal. The questionnaire was an adapted version of the Likert scale, frequently used in clinical trials to measure dyspepsia . Our symptom score graded from 0 till 5 (0 = no complaints and 5 severe complaints) (Table 2), for the following seven signs and symptoms: bloating, gastric fullness, belching, nausea, vomiting, constipation and epigastric pain. Thus the maximum score for each patient was 35 points. Upon completion of the questionnaire with the investigator, patients received a test meal after an overnight fast during the first week, in sitting position and under supervision by a study nurse. Body mass index (kg/m2) was calculated, curves and percentiles were used as reported by Rolland-Cachera et al. . The test meal consisted of a pancake enriched with 13C octanoic acid. Preparation was as follows: 50 µL 13C octanoic acid was mixed with 17 g flour, 7 g sugar, 1 egg white, 1 frozen egg yolk and 40 ml half-skimmed milk. The preparation was baked with 5 g margarine. Sugar (5 g) was added for consumption. This meal accounted for 230 calories (12.25 g proteins/27 g carbohydrates/8.8 g fat) . Breath samples were collected in vacutainers: 2 basal breath samples prior to the test meal, followed by one sample every 15 minutes during 4 hr. Table 1. Inclusion and exclusion critera of the study patients. Table 2. 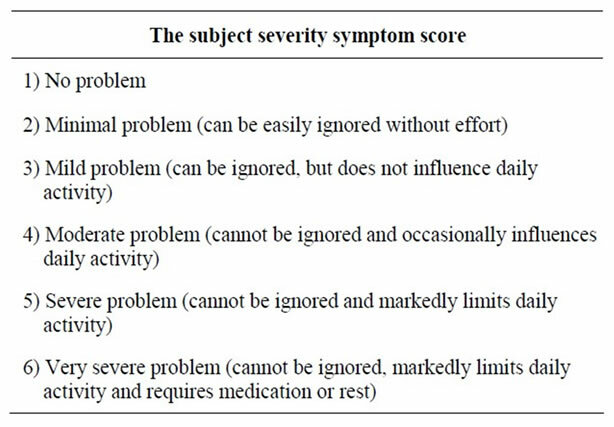 The subjective severity score adapted from the existed likert scale and practically changed for our study population . and oxidized after being emptied out of the stomach into the duodenum. Measuring the percentage of expired 13CO2 in the total CO2 pool using Isotope Rate Mass Spectrometry (IRMS). Mathematical analysis of the percentage of 13C recovery allows calculation of 2 parameters namely the gastric half-emptying time (T½) calculated in minutes and the gastric emptying coefficient (GEC). Formulas for both parameters of gastric emptying for solids were formulas have been reported . Breath samples were analysed in the Laboratory for Digestion and Absorption, University Hospital Leuven, Belgium. The results were compared to previously obtained normal values for gastric emptying (GE) of a similar solid test meal in age matched healthy adolescent girls and boys (Table 3). Children were divided into three groups: delayed-, slowand normal gastric emptying (respectively DGE, SGE and NGE). Children with DGE or SGE were compared to those with NGE. For the subject severity score, the non-parametric Mann-Whitney U-test was applied. As the distribution of weight loss in the normal gastric emptying group allowed for the normality assumption (Kolmogorov-Smirnov, p > 0.200), we tested the difference in weight loss by independent t-test (omitting the equal variances assumption). Statistical calculations were performed using the SPSS statistics version 18.0. Table 3. Study results of the patients; the results of the symptom score and the gastric emptying measured with the 13C octanoic acid breath test are compared with a control population of the same age and gender  (R = restrictive and P = purgative). 25/35 (71.4%) was found in the groups with DGE and SGE while a severity score of 19/35 (54.3%) was found in the normal group (p = 0.029). The delayed group (DGE and SGE) had 25.0% weight loss whereas a weight loss of 17.6% was found in the group with NGE (p = 0.059). 19/24 (79%) patients had a restrictive character of their eating disorder and 5/24 (21%) have a purging type eating disorder. In the purging group we found 3/5 DGE and 2/5 NGE; in the restrictive group we found 12/19 (63%) DGE. 7/19 (37%) Anorexic adolescents had NGE. Delayed gastric emptying (DGE + SGE) was thus recorded in 62%, with an average severity score of 25/35. The majority of these anorexic patients had a restrictive character of their eating disorder with an average weight loss of 25%. Observations in “the biology of human starvation” by Keys et al. in 1950 indicate that in the starving man the nutritional state plays a key role in gastric emptying. Hence the hypothesis that severe malnutrition by atrophy of the smooth muscles of the gastro-intestinal tract can explain delayed gastric emptying, especially in restrictive anorexic behaviour, seems plausible [15-17]. Other muscle dysfunctions are on record in anorexia. Myocardial muscular atrophy is seen in the acute state of starvation, with thinning of the left ventricular wall and a reduced left ventricular mass index . Atrophy of type two fibers in skeletal muscle explains functional disturbances in daily life . Therefore the possibility exists that gastric muscle function may be altered in emotional disturbances. The fear to eat has induced a depreciation of these gastrointestinal symptoms: “anorexics will complain of feeling full after a few bites” . In one study where oesophageal motility is investigated with manometry, there was no improvement of oesophageal symptoms like dysphagia, belching and heartburn after a prolonged rehabilitation program with return to normal weight. An improvement, only for gastric and colonic symptoms, was observed. The authors found no association between frequency and severity of oesophageal symptoms and major motor disturbances of the oesophagus . This is the first report comparing the results of the GE breath test with a subjective symptom score; we observed that a significantly higher symptom score of 25/35 was found in the groups with DGE and SGE. Thus the presence of a 25% weight loss and a symptom severity score of ≥25/35 in an anorexic adolescent are objective components of delayed gastric emptying demonstrated by the 13C octanoic acid breath test. This is probably due to the fact that delayed GE is caused by wasting of the smooth muscle fibers of the gastrointestinal wall resulting in dysmotility. Other observations mentioned malnutrition as a cause of dysmotility: acute gastric dilatation in prisoners of war during refeeding and slow gastric emptying in normal volunteers during starvation . That gastric emptying is correlated with body weight is confirmed in obese subjects who evacuate gastric contents more rapidly . To our knowledge there are no data on the use of the 13C octanoic acid breath test in anorexic adolescents for measuring gastric emptying time. The gold standard for measurements of oesophageal and gastric emptying in patients with eating disorders has been radioscintigraphy with technetium 99 labelled trithelennetetraamine polysterene resin . Gastric emptying times have been studied in the same patient without and with the use of metoclopramide [10,22]. In our view, for anorexic adolescents with gastrointestinal complaints the 13C octanoic acid breath test is better, easier, cheaper and safer than radioscintigraphy with technetium 99 labelled triethelenetretraamine polysterene resin (99mTc TETA) and the electrogastrogram to confirm gastric dysmotility disorders [22-24]. With this breath test technique followup studies become easier and safer. Our observations point to one of the main reasons why it is difficult to refeed some anorexic patients. It is probably useful to choose more digestible diets for refeeding: namely meals and nasogastric feeding containing more whey and soy proteins and less casein and carbohydrate. The latter digest faster in these patients and therefore facilitate refeeding. It is important to plan refeeding with specialized nutrition teams for every severely anorexic patient, to prevent or minimize these gastrointestinal complaints. Future gastric emptying studies should be compared with gastric biopsy, in the acute stage and after refeeding, to document atrophy and subsequent recuperation of smooth muscle fibers. H. Bruch, “Anorexia Nervosa,” In: A. E. Lindner, Ed., Emotional Factors in Gastrointestinal Illness, Excerpta Medica, Amsterdam, 1973, pp. 1-15. C. J. McClain, L. L. Humphries, K. K. Hill and N. J. Nickl, “Gastrointestinal and Nutritional Aspects of Eating Disorders,” Journal of the American College of Nutrition, Vol. 12, No. 4, 1993, pp. 466-474. M. Van Den Driessche, “Study of Gastro-Intestinal Motility in Infants and Children Using 13C Breath Tests. Maturation of Gastric Emptying and Orocaecal Transit Time,” Acta Biomedica Lovaniensia 251, Leuven University Press, Leuven, 1991. American Psychiatric Association, “Diagnostic and Statistical Manual of Mental Disorders,” 4th Edition, Author, Washington, 1994. M. F. Rolland-Cachera, T. J. Cole, M. Sempé, J. Tichet, C. Rossignol and A. Charraud, “ Body Mass Index Variations: Centiles from Birth to 87 Years,” European Journal of Clinical Nutrition, Vol. 45, No. 1, 1991, pp. 13-21. Keys, J. Brozek and A. Henschel, “The Biology of Human Starvation,” University of Minnesota Press, Minneapolis, 1950, pp. 587-600. D. Waldholtz and A. E. Andersen, “Gastrointestinal Symptoms in Anorexia Nervosa. A Prospective Study,” Gastroenterology, Vol. 98, No. 6, 1990, pp. 1415-1419. R. A. Wright, S. Krinsky, C. Fleeman, J. Trujillo and E. Teague, “Gastric Emptying and Obesity,” Gastroenterology, Vol. 84, No. 4, 1983, pp. 747-751. P. A. Domstad, W.-J. Shih, L. Humphries, D. Deland and G. A. Digenis, “Radionuclide Gastric Emptying Studies in Patients with Anorexia Nervosa,” Journal of Nuclear Medicine, Vol. 28, No. 5, 1987, pp. 816-819. T. L. Abell, J. R. Malagelada , A. R. Lucas, M. L. Brown, M. Camilleri, V. L. Go, F; Azpiroz, C. W. Callaway, P. C. Kao and A. R. Zinsmeister, “Gastric Electromechanical and Function in Anorexia Nervosa,” Gastroenterology, Vol. 935, No. 5, 1987, pp. 958-965.